Do you love the idea of going on a hike out into the wilderness to have your wedding ceremony? Hiking elopements are super fun and gorgeous, but be warned, it take a BIT more planning the a normal elopement. You’re going to be planning your wedding, as well as planning your hiking trip at the same time. But its going to be double the fun as well- promise! 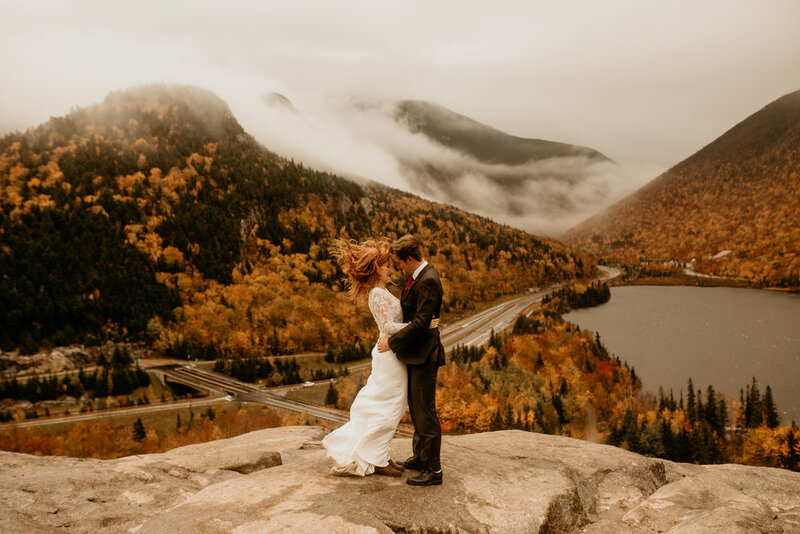 I want your hiking elopement to be the absolute best that it can be so here are a few tips to make it easier for you! So before you pick a hike for your romantic adventure, you need to take into consideration everyone’s experience with hiking. Will you be training for this hike? Will your 60 year old Mom be able to make the trek? What is the terrain going to be like? Even if you have experience with hiking, you gotta think about your officient, witnesses and guests too! Don’t overlook yours or their safety and try to do something that is beyond everyone’s ability. You want your wedding to be unforgettable, but not because of an emergency mountaintop helicopter rescue! Also, if you do not have a lot of experience with altitude, you or your guests might be prone to altitude sickness. If you have never experienced high altitudes before, you don’t know how your body will react and it could potentially ruin the whole trip for you. Plan appropriately based on everyone’s experience with altitude and terrain to have a safe and fun time for everyone! Planning any hiking trip means that you are at the mercy of nature’s elements. Be sure to plan ahead and research the weather, figure out whether or not the route will be accessible at that time of year, and discover if you will need special equipment to complete the hike. If you want your hike to take place during the winter, you’re probably going to need crampons, microspikes, snowshoes, or other necessities If you are planning on hiking from lodging to lodging, you’ll also want to check that those places will be open and accessible in the winter months. .
Ok guys, to plan your route, you first need to think about length. (That’s what she said). Do you want to do a multi-day hike? Do you want just a day hike? Will you be packing all of your gear in or would you prefer to leave it at an airbnb or hotel? Its definitely going to be easier for any of your guests to just do a day hike, so maybe consider having everyone hike in with minimal gear, and only you and soon-to-be spouse carry overnight gear so you can continue your adventure after the ceremony while everyone else heads home. Take into consideration where you would like to spend your wedding night as well. Do you want to be looking up at the stars or would you rather be in a 5 star hotel? Either is great, but choose what YOU want! When going on a longer hike, you’re probably going to have to have your wedding clothes. On shorter hikes, you can get away with wearing them or even carrying the garment bag, but if you’re on a longer trek, that becomes less of an option. One way to do it is to hook your garment back onto your backpack. Secure it with an actual belaying hook instead of using just a hanger. Another way to do it is to roll your dress around a piece of foam and place into your backpack. the foam helps to absorb wrinkles and the rolling method aids this as well. If you must fold the dress, fold it vertically and not horizontally. These wrinkles will come out either AND be easier to photoshop for your photographer! Employ a similar rolling method for the suit. Place your flowers in the very TOP of your backpack where the drawstring usually is. Usually florists will pack them with plastic and some water to keep them hydrated for the hike. The boutonnière I usually place in a ziplock and pin to the side of the backpack. Or just put him wherever he won’t get squished! If you have any questions about planning a hiking elopement of your own, feel free to reach out in my contact form at the bottom of the page!